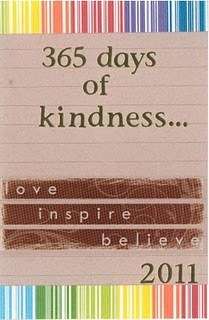 The cover of Daena's 365 days of kindness… journal. Today I’m putting the focus on my friend’s blog, 365 Days of Kindness. Daena is an incredible young lady, and one of my close friends. Last year, she started Project 25, encouraging people to do random acts of kindness. This year, she decided to expand, and challenge herself to do a random good deed every day for a year. She’s writing them down in a journal, and slowly uploading them to her blog. She’s a bit behind (having only recently uploaded the ones for January), however it is a fantastic project, and a wonderful challenge. We find this mentioned in the gospels of Jesus. The second commandment that Jesus lists here – love others as you love yourself – is just what Daena is practicing here, Loving others, whoever they may be, as she loves herself. Wouldn’t the world be an amazing place if we all followed Daena’s lead and looked for ways to show love to others? Oh wow… do you want to know something funny? I only found your post today and Today (25th March 2012) i am giving a talk at the church about this exact thing! Gods two great commandments and Kindness! I cant believe i found this today! Anyways, God works in mysterious ways!